Take a trip to Memphis, Tennessee and you'll be overwhelmed by many things. For vegetarians, it's the extraordinary amount of barbequed meat; for travel-enthusiasts, it's the family of ducks who live at the Peabody Hotel; and for music lovers, it's the sweet sounds flowing from BB King's Blues Club on Beale Street. 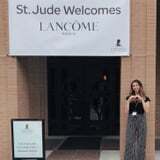 For me, as a beauty editor, it's that I learned the real meaning of beauty in an unlikely place: St. Jude's Children Hospital.